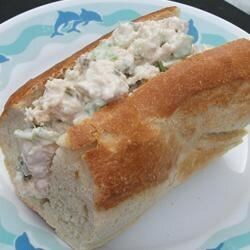 "The chicken salad is quick and easy. If you want a little 'zip', add a few drops of hot sauce to the mixture! Serve on lettuce as a salad or on bread as a sandwich." Combine the chicken meat, celery, mayonnaise, onion powder and sweet pickles. With the pickles, it tasted just like tuna fish salad. I probably won't try this again. This recipe is straight off the label of Tyson chicken in the can. I'm very picky & don't eat chicken salad, but I made this for my fiance. He said it was great, it tastes just like what his mom used to make! This is a great and really quick recipe. I usually make it on Sunday night and it is gone by the next day. I usually double the recipe.